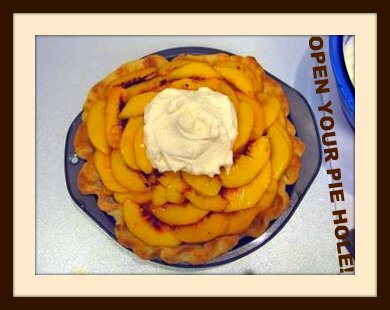 I posted this Fresh Peach Pie recipe last year and I'm re-posting now because it's so fantastically good it deserves a re-post. The best thing about this pie is you don't bake the peaches - they are fresh, not mushy and cooked in gelatinous sauce. The other extra-special feature of this pie is the brandy filling layer spread on the bottom of your baked crust. I use this wonderful brandy P and I bought at the Jepson Winery in northern California, where we spent a lovely hour late one afternoon back in 2005. Beat butter at medium speed with electric mixer until creamy; gradually add 1 C powdered sugar and brandy, beating well. Spread in bottom of pastry shell; chill. Beat whipping cream at high speed with electric mixer until foamy; gradually add 3T powdered sugar and vanilla, beating until soft peaks form. Cover and chill. Note: You can use Maker's Mark if you don't have brandy. Works just fine! That is a truly terrible picture and my crust shrunk (?). It's really a beautiful pie - pinky swear. *Reserve the juice from the peaches when you drain them and mix it with a little brandy and pour it over vanilla bean ice cream and -- wow. Dessert for the next night! Millions of peaches, peaches for free? Fancy mailing me some pie? de - This will be a favorite if you try it - it is pie Heaven! mo. - Dude, I would so send you this pie if I could. Hope you are enjoying the new blogging schedule! I might short circuit my lappy. Amy, that is OH MAH HOLY HELL tonguegasmic looking!! I am definitely making that soon! That may be our Thanksgiving dessert this year! YUMMY! WOW. That sounds good! We grill a lot of peaches at our house in the summer. I am thinking I could make this, using grilled peaches to add that smoky flavor. I can testify, this pie is awesome! 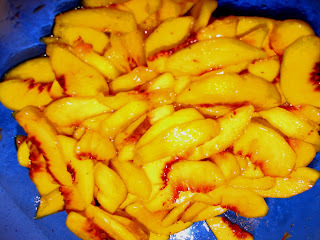 I made last week because I had an abundance of peaches. It is soooo yummy. And the brandy, butter, sugar spread on the bottom is so good. I need to make another. Adding this to my favorites for when our peaches come in. Thanks for sharing! 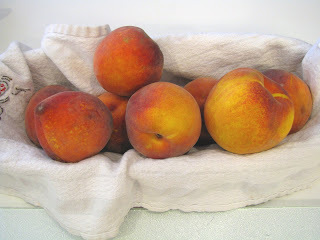 Rachel - If you can get fresh juicy peaches at Thanksgiving I will be so jealous! In Tennessee I can't. Shannan - I must know how you grill peaches. I want to try that. Lori - Yeah! I'm glad it turned out well. Now I have to make one this week because I'm craving it. Hoosier - You will LOVE this pie. That looks awesome! May have to get to the Farmer's Market for some peaches.